Over 250 industry leaders gathered at The Savoy Hotel in London to celebrate their achievements throughout the year. 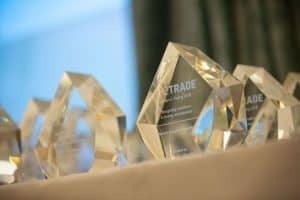 The TRADE is pleased to announce the winners of the Leaders in Trading Awards 2018, including the Algorithmic & EMS Trading, Editors’ Choice and Buy-Side awards. Over 250 industry leaders gathered at the Savoy Hotel in London last night to honour and celebrate the achievements of their peers, with 35 awards across the three categories handed out. In the Algorithmic Trading & EMS awards category – based on The TRADE’s annual surveys – several firms took home multiple awards, with Kepler Cheuvreux, ITG and Instinet collecting seven awards between them, while Cowen was named Prime broker of the year. The Editors’ Choice category are always highly contested awards and this year proved no different. Across the 12 awards, this year’s winners – as judged by The TRADE’s editorial panel – were all worthy winners. Cboe Europe walked away with two awards for Outstanding equities trading venue and Outstanding periodic auction venue, while Liquidnet triumphed in the Outstanding block trading venue award. London Stock Exchange Group was crowned the Outstanding global exchange group of the year. The final category of the evening were the much-anticipated Buy-Side awards, which this year were opened to industry nominations and The TRADE received almost 1,000 votes to decide the final winners. Hermes Investment Management took home the Trading desk of the year award, while Amundi were winners of the first emerging markets trading desk of the year award. The Trader of the year awards, always a highlight of the ceremony, went to Neil Bond of Ardevora Asset Management (hedge fund) and Neil Joseph of JP Morgan Asset Management (long-only). There were also prestigious Lifetime achievement awards for Alasdair Haynes, founder and chief executive of Aquis Exchange, and Carl James, global head of fixed income trading at Pictet Asset Management. A photo gallery of the evening can be found here.